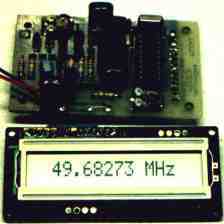 The result is a nice frequency counter that reads frequency from 1 Hz to 50 MHz and displays it on a 16 character LCD display. Auto-range feature provides floating decimal point and automatic placement of suffix (Hz, KHz, or MHz). Gate speed automatically decreases to one second below 100 KHz to display frequency with a resolution down to an amazing 1 Hz. LCD Front Panel Set: $8! http://www.sxlist.com/techref/new/letter/news0304.htm 15 MHz PC hosted version with Serial interface and must lower parts count. I have found a bug. When the display should show 255Hz, it shows 511Hz. 254 or 256 is fine, but not 255. The same goes for 511. It shows 767 instead. Bary Smith says: "4 bit LCD / Serial Output Here is my updated version of the driver code for this using the PIC16F628 as a drop in replacement for the F84 (F84 is also still supported). The other main changes are a switch to 4-bit LCD interface to free up some pins and USART output so the frequency can be fed to a PC COM port." I`ve measured no more than 80mhz because that is the highest frequency source I had in hand, I guess it could get higher. It is important the AS in the 74AS IC because they work at higher frequency. I've made a pcb for this circuit, I omitted the preamp as i'm using it for a homebrew function generator. If anyone wanna use this pcb I'd be happy to email it to you. to process the instruction. so i insert some "call int_del"
WoW! Thanx for the 8X2 code!i tried making it myself but i failed.I did a search for 16X1 Lcd but could not find it. Now i can have my own frequency counter. The listing that contains a startup message is all messed up,i sorted it out and modified it for the 8X2 LCD, where should i mail it so that it can be added to this webpage? If you use the 16F84A for this project the software needs to be updated for bank switching to access the OPTION, TRISA and TRISB registers. The OPTION and TRIS commands compile with a warning in MPIDE but do not execute when burned in the 16F84A microcontroller. Please post your questions on the questions page (click here). Your question may already be answered there!